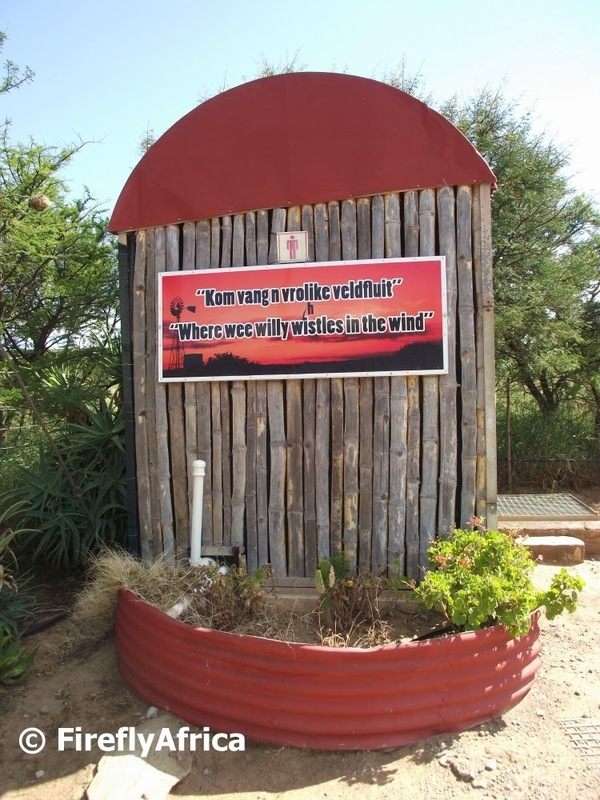 Driving along the N10 between Port Elizabeth and Cradock there is a memorial next to the road near the town of Cookhouse. Driving back from Cradock the other day I decided to stop and have a closer look. 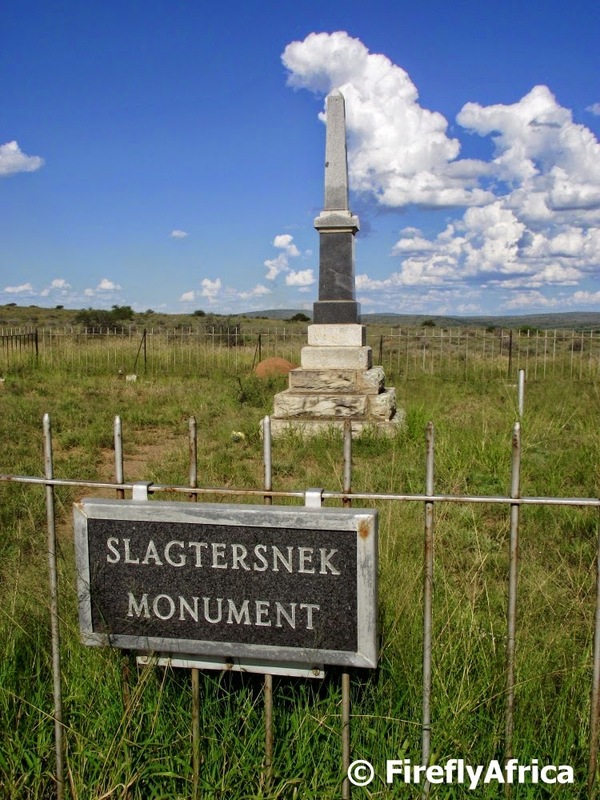 The Slagtersnek Monument remembers the Slagtersnek Rebellion and the subsequent hanging of 5 of the rebels, an event that changed the area forever and possibly had a big role to play in the start of the Great Trek. The museum in Somerset East has a great exhibit about the event which includes the beam the rebels were hung from. In 1815, a farmer from the eastern border of the Cape Colony, Frederik Bezuidenhout, was summoned to appear before a magistrate's court after repeated allegations of his mistreating one of his Khoi labourers. Bezuidenhout resisted arrest and fled to a cave near his home where he defended himself against the soldiers sent to capture him. When he refused to surrender he was shot dead by one of the soldiers. One of Bezuidenhout's brothers, Hans Bezuidenhout, swore revenge. Together with a neighbour Hendrik Prinsloo, Hans Bezuidenhout organised an uprising against the British colonial power, believed by them to be hostile towards the Afrikaner farmers. On 18th November 1815, a commando of rebels met an armed force from Landdrost (magistrate) Jacob Cuyler, the military commander on the eastern frontier, at Slachter's Nek. Negotiations failed and the majority of the rebels left without any shots being fired. Twenty rebels surrendered, followed by several more over the following days. However, some of the leaders, among whom was Hans Bezuidenhout, refused to turn themselves over to the British authorities. On 29th November 1815, they were attacked by colonial troops. Everybody but Bezuidenhout surrendered and, like his brother, Hans died while resisting arrest. The rebels were finally charged at Uitenhage. Some were cleared, others imprisoned or banished. Six were sentenced to death but one of these was pardoned by the Governor, Lord Charles Somerset. On 9th March 1816 the remaining five were hanged in public at Van Aardtspos. Four of the nooses broke during the procedure as the hangman who came to perform the execution had not realised there were five to be hung, and old ropes had to be used. The four whose ropes broke, as well as the public, pleaded for their lives but Culyer ordered that they be hanged a second time and they were hung one by one. The names of the five who were hanged were Hendrik Prinsloo, Stephanus Bothma, Abraham Bothma, Cornelius Faber and Theunis de Klerk. 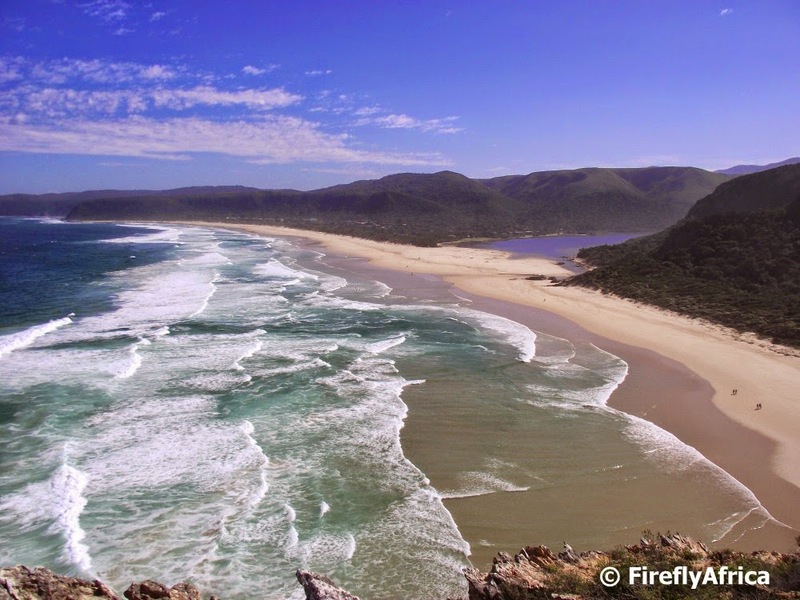 I have a very special spot in my heart for the Gamtoos Valley west of Port Elizabeth, having visited there quite often while I was working as a tourist guide. 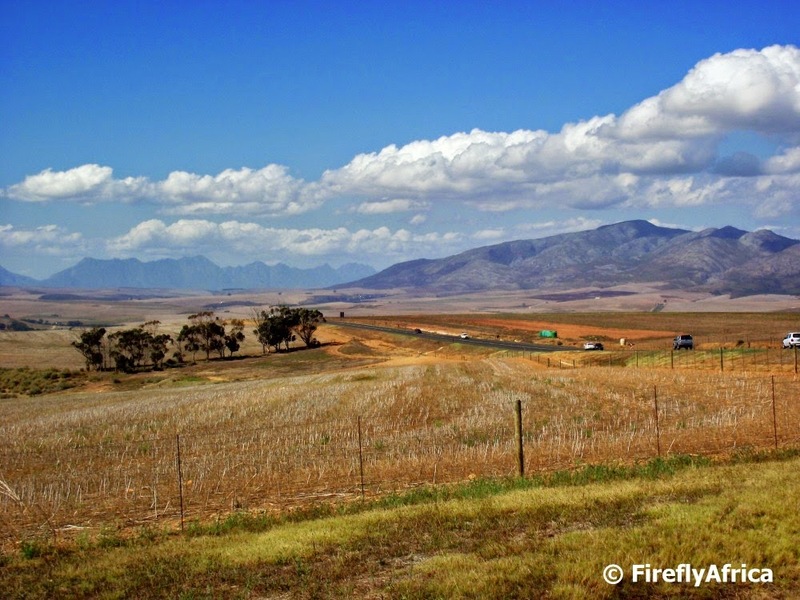 Since then we try to get out there every now and then for things like the Gamtoos Citrus Festival, Patensie Boere Basaar and the Gamtoos Adventure Drive and then usually stay in the Patensie area. 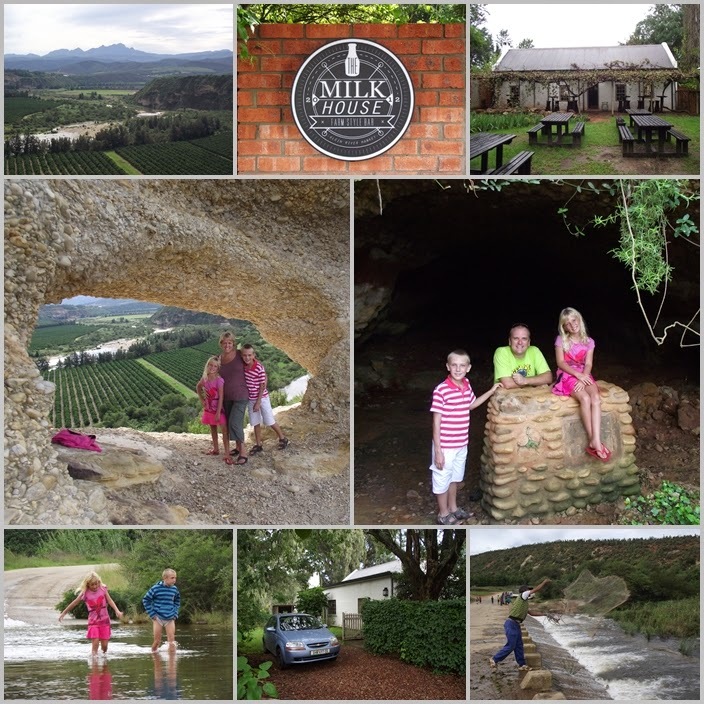 A little while ago Carol Pearson of The Milkhouse Farmstyle Bar dropped me a line and invited me to bring the family to stay at their self catering farmhouse for a weekend and explore the Hankey area for a change. Although you drive through Hankey to get to Patensie I've never explored the area further than the one or two main historic sights around town so jumped at the opportunity. We made a conscious decision long ago to give the KidZ opportunities to explore and experience places and things that most people probably never do or show their children and that is why I would never say no to an opportunity like this. The Milkhouse is situated on a farm and is surrounded by citrus orchards. The accommodation is a 4 bedroom farmhouse that can probably sleep about 10 people and can be booked for individuals or as a whole. The Milkhouse Farmstyle Bar is situated right next to it and is open to private functions, special events and guest house patrons. We had dinner there the first evening and the home made burgers and hand cut fries were out of this world. I will do a more detailed post with more photos of the Milkhouse soon. Our weekend in Hankey was mostly spent being lazy but not without exploring the area thoroughly. Climbing to the top of the berg window at Vensterhoek was definitively the highlight with the stunning view to both sides of the mountain making up for the effort to get there. Visits were also made to the biggest sundial in Africa, Saartjie Baartman's grave and the historic Phillips Tunnel. The KidZ also loved watching the local farm workers fish in the river with nets and Drama Princess even jumped in to help throw back the little fish that got caught in the net. Our time in Hankey made me realise once again that one often overlooks little places like this and bypass it on the way to more glamorous and well know destinations. Is there a lesson to be learned? Look at the destinations in your own back yard first. Its here where you will find the perfect weekend getaway that won't cost you a fortune in fuel and other expenses. Farm stalls all have their unique points and quirky bits. 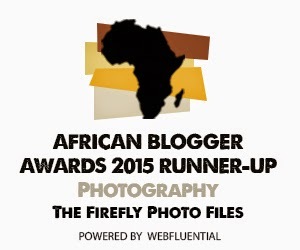 Over the weekend the Damselfly made malva pudding and I decided to nab her recipe for a post. 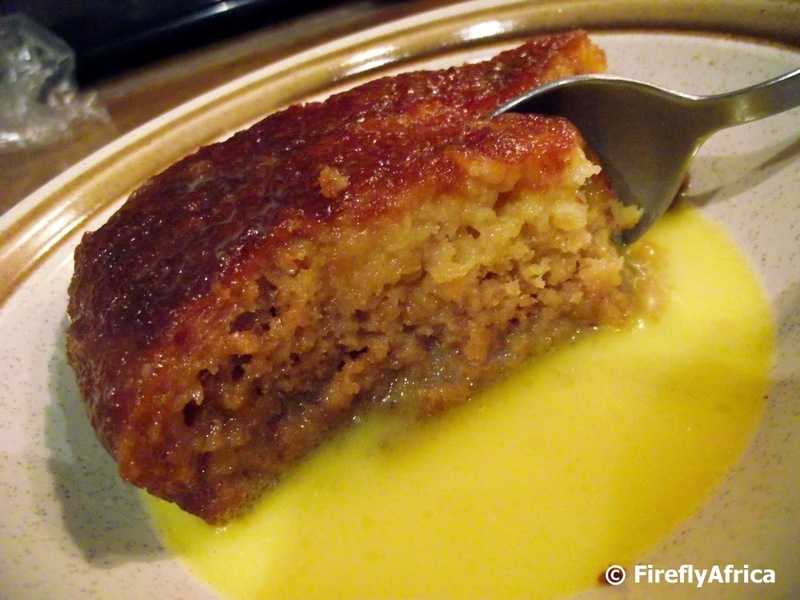 Malva pudding is a sweet baked pudding of Cape Dutch origin, usually served hot with custard, cream or ice-cream. My mom always made a double portion of the sauce and we would then eat it with the sauce poured over (like I did this weekend as you can see in the picture). It is made with apricot jam and has a spongy caramelized texture. It is often found on the dessert menu of South African restaurants and is a very traditional South African dish. The pudding's name is derived from Malvasia wine from Madeira. The dessert and dessert wine used to be served together after the main course at Cape tables. It is of distinct Cape Dutch origin with many unique additions which may differ from one area to the next, e.g., ginger or apricot jam. There are also many variants of this dessert, namely, the Cape Brandy Pudding which also includes brandy and dates and the Tipsy Tart which contains only brandy. Use a 2 liter size baking container. Spray with a non stick spray. Mix the bicarb into the milk. Mix the rest of the ingredients separately. Now stir the bicarb / milk mixture into the rest of the ingredients and mix well. Put the mixture into the baking container and bake for 20 - 30 minutes at 180C. Take out and punch little holes in it. While the cake is baking heat the sauce ingredients in a pot and mix together till all melted and mixed. Pour sauce over cake. I hope this all makes sense. Enjoy! Spiders are commonplace in live and everybody have had flatties in their homes that sometimes (not always) get ignored as they are totally harmless. But every now and then one makes their way into the house you just can't ignore, even if they are relatively harmless. Who has never found a rain spider in a corner or behind a curtain and not just about freaked. The Common Rain Spider (Palystes superciliosus) is a species of huntsman spider commonly and widespread found in South Africa. But this post isn't really about the actual rain spider but rather its "nest." I have often found people see a rain spider egg sac and not know what it is. After mating in the early summer, the female rain spider constructs a round egg sac about 60–100 mm in size made of silk, with twigs and leaves woven into it. I've even found one in Addo with a sugar packet woven into the mix. 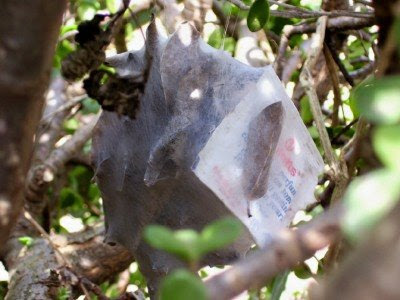 These egg sacs are commonly seen from about November to April. 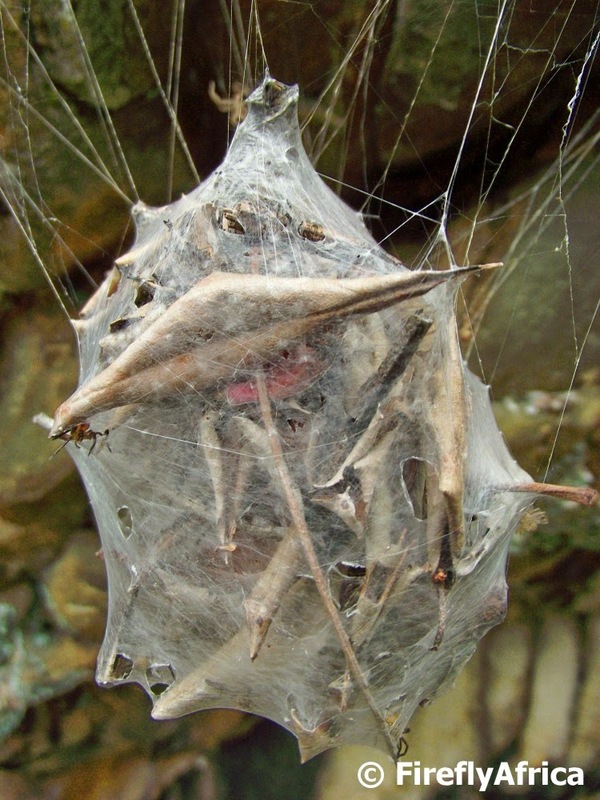 The female constructs the sac over 3–5 hours, then aggressively guards it until the spiderlings, who hatch inside the protective sac, chew their way out about three weeks later. Have a careful look at the first picture and you will see that the baby spiders have exited the egg sac Females will construct about three of these egg sacs over their two year lifespan. Is it a view that's been waiting for you for centuries? A setting that gives you goosebumps when you see it for the first time? A scene so striking it remains in your memory forever? Is it a moment that stops you in your tracks and leaves you in awe? Some people spend their whole lives looking for them. Cause in this place, beauty has a much deeper meaning which is why when you meet South Africa, you'll reconsider what you think you know." South African Tourism has just released their latest destination marketing video for South Africa and it's really thought provoking. 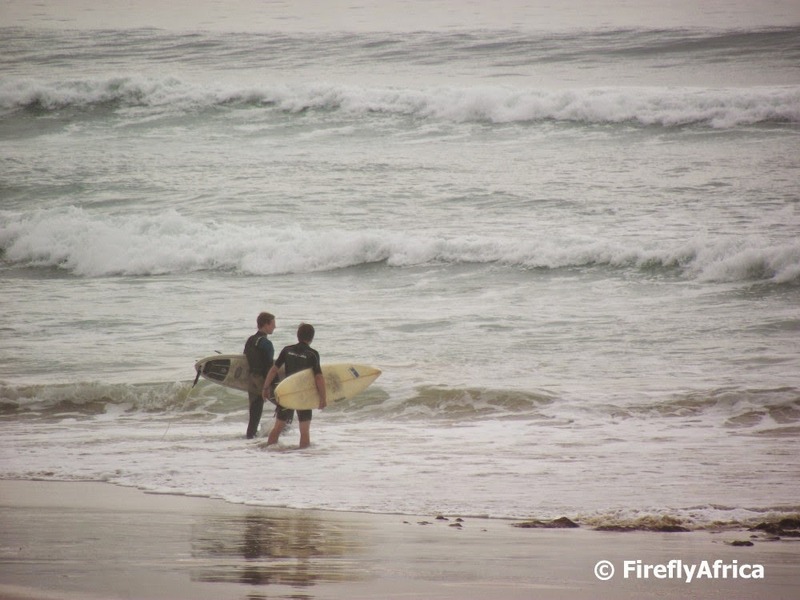 Its not just about seeing South Africa's beauty, but also how you experience it using all your senses. I'm starting to plan all my trips and holidays not just around what I want to see and do, but also around where there are Geocaches in the area. If you don't know much about Geocaching then you would wonder why and how it could enhance a holiday, but believe me it does. It often takes you to spots you may not have planned to visit otherwise but once you've been there you are really glad you did. One of those on our recent visit to Natures Valley was The Point. 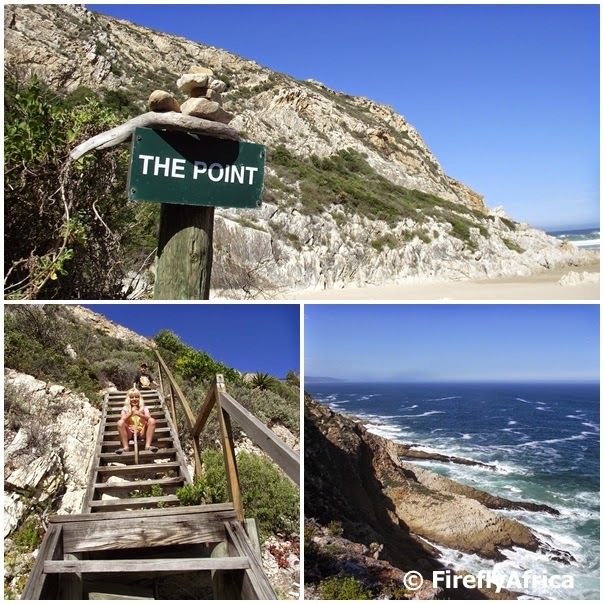 The Point is situated on the eastern side of the Natures Valley beach where the Otter Trail comes out with a magnificent view of the coastline. At first the Damselfly wasn't too keen to climb to the top with the KidZ and I, but relented in the end and tagged along. Although its quite a steep climb its not too difficult with steps aiding you most of the way. We had to keep telling the KidZ not to get to close to the side as they were flying up ahead of us, laughing at their unfit parents huffing and puffing behind them. Looking back as you climb higher and higher you start to realize that you will be in for an absolute scenic view treat once you are at the top. Before we knew it we were there and turning back this was the view waiting for us. WOW! Through and through worth it and highly recommended to anybody visiting the Natures Valley area. Even the Damselfly couldn't help but to agree. Oh yes, and I did find the cache which has been up there for 12 years already making it the oldest cache I've found so far. A recent road trip to Cape Town for work just proved yet again that there is no such thing as wasted time to be on the road between two places. It will take a bit longer to get to the destination but make time to stop, even if its just to enjoy the scenery and countryside. I did just that while driving through the Overberg with a quick leg stretcher at a picnic spot. You know the saying when something goes on till the cows come home? Well, a day literally does exactly the same. While camping at The Crags the cows came by to be milked at about three in the afternoon and then headed home to the meadows just after five thirty... when the sun heads for the hills. This means the day does go on till the cows come home. I used to travel down the Garden Route quite often while I was still tour guiding but these days don't often get a chance to go further than the Tsitsikamma. Driving down to Natures Valley on our recent Easter weekend Sho't Left in the area I had to stop at one of the view points on the way down on the Grootrivier Pass. Its not a view point as much as it's a tree point. The view is of a little valley next to the pass with a massive Outeniqua Yellowwood standing out above the rest of the forest. The Outeniqua Yellowwood (Afrocarpus falcatus) is South Africa's national tree. It is an evergreen conifer that often grows up to about 45 meters tall with some known to reach 60 meters. Some of the largest individuals occur in the Knysna, Tsitsikamma and Amatole montane forests, where some specimens are over 1000 years old. 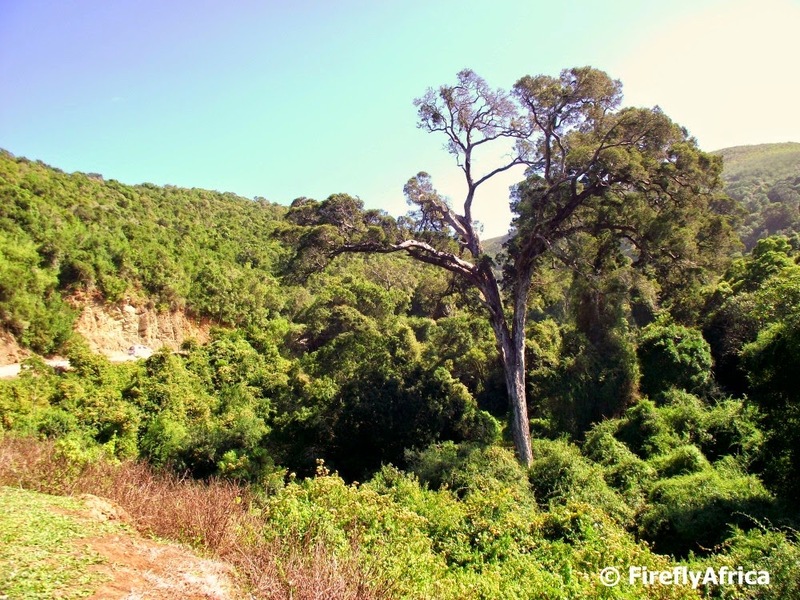 Outeniqua Yellowwoods are protected by law and can only be cut down with a special permit. Just a couple of other facts courtesy of Wikipedia - The trunk can be 2 to 3 meters wide with a gray-brown to reddish and smooth but flaky bark. The leaves are arranged in spirals on the branches. They are small and narrow, up to 4.5 centimeters long by about 6 millimeters wide. The yellowwood is a dioecious species, with male and female structures on separate plants. The male cone is brown with spiralling scales while the female cone has one scale bearing one seed between one and two centimeters long. 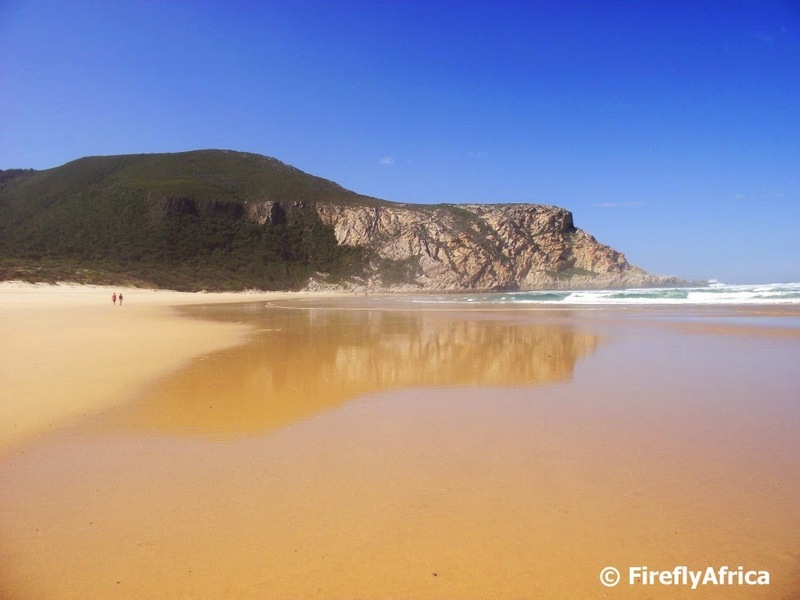 A holiday experience can be made up of anything and for our Easter long weekend Sho't Left to the Crags and Natures Valley we were expecting it to be made up of camping, swimming in the Natures valley lagoon, walks and Geocaching. Little did we expect a farm experience that got the KidZ a lot more excited than any of the mentioned activities. The campsite was situated across the road from the Natures Way Farmstall which on its turn is located on a working dairy farm. The farm milks Jersey cows twice a day and every morning and afternoon the cows are herded past the campsite to the milking shed and then back again to the meadows where they spend the rest of their time. 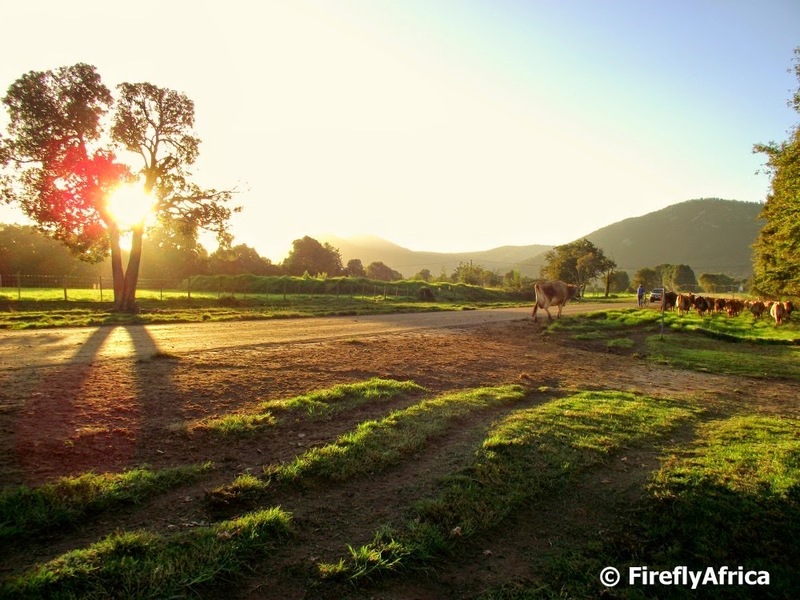 The Tsitsikamma Sunrise Caravan Park where we stayed had on their website that you can go and see how the cows get milked across the road at the farm stall. Little did we know that its not just one or two cows but close to 200 of them. 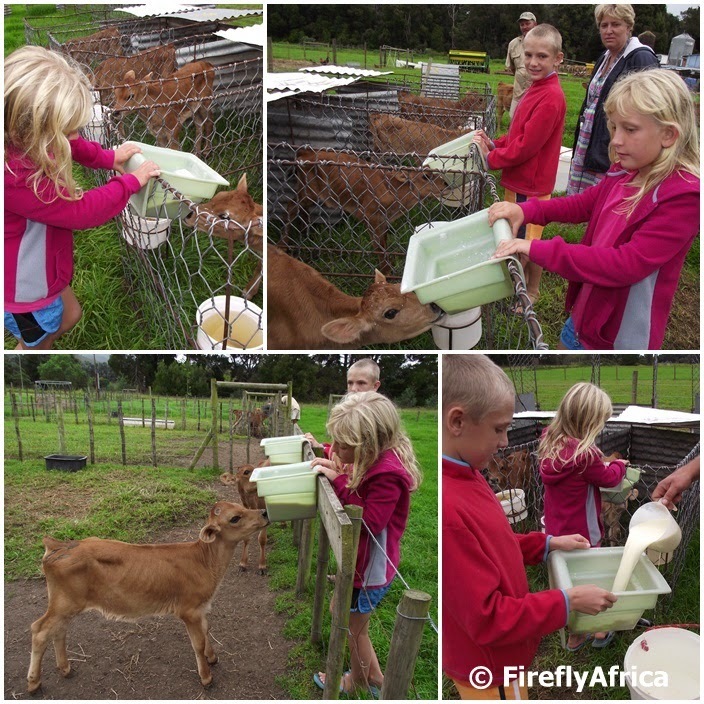 On our first morning there we went to find out what time they milk and were told 4pm to 6pm. This meant that the KidZ were watch watching all day long and made sure we were back in time from the beach to go and see the cows. Not just was it the KidZ first time in a commercial dairy but also my own. I was snapping pictures and asking questions while trying to stay out the workers' way best I could to allow them to continue with their work. After a while one of the workers called the KidZ over and showed them how the machines worked. 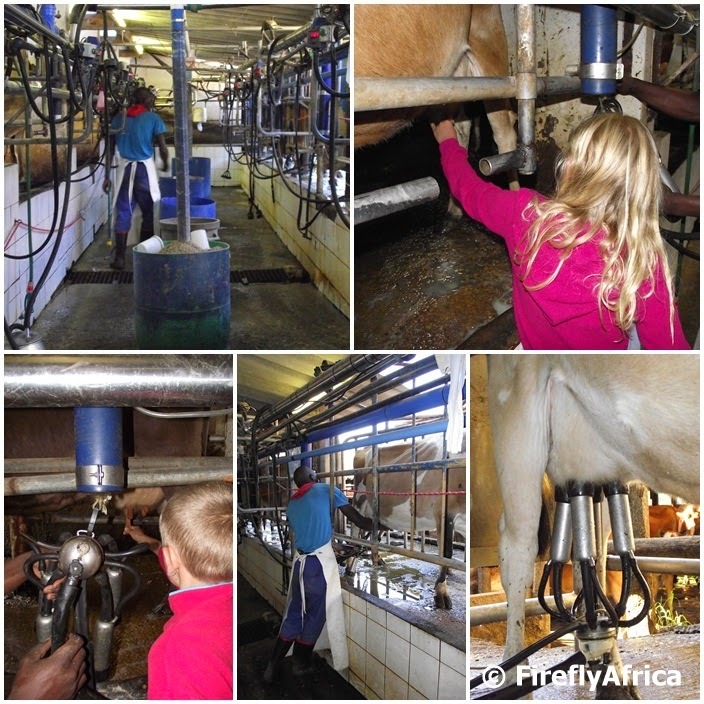 They even got to try their own hands at milking and Drama Princess got to put the milking machine on one of the cows. WOW! And there I thought we may just get to have a peek before being asked to leave. Kudos to these workers to take time out in between doing their job to show these city folk what they do even if they don't have to. We were barely out the milking shed and the farm's foreman went past with a buck bucket full of milk for the calves. Before we could say a word the KidZ were off after him to give a hand and he didn't complain because it meant he could stand back and let the KidZ do their thing. The feeding process is a bit more "advanced" than standing with bottles but on the other hand its designed for one person to feed a couple of calves at a time. While the KidZ were busing the foreman explained to us the whole process of rearing calves, when they get weened from milk and where the go when they get a bit older. In addition to all of this we also got to see a calf being born on our last afternoon there and all in all this accumulates and contributed to a much more memorable holiday than just hikes, Geocaching and swimming.